Accuray Incorporated has announced that studies continue to demonstrate the unmatched flexibility of the TomoTherapy System to treat, with precision and efficiency, a wide variety of indications of all complexities. More than 50 studies were presented during poster and oral sessions at the 36th Annual European Society for Radiotherapy & Oncology (ESTRO) Meeting in Vienna, May 5-9. A study evaluated hypofractionated intensity-modulated radiation therapy (IMRT) using TomoHelical™ in 121 postmastectomy patients with implant-based immediate breast reconstruction (IBR). Results demonstrated the TomoTherapy Treatment Planning System produced high-quality treatment plans providing optimal coverage of both the chest wall and supraclavicular region and sparing of all organs at risk. An additional analysis showed that the superior dosimetric outcomes provided treatment benefits. The side effect profile following treatment was favorable, with no patient experiencing greater than grade 2 acute toxicity. Rates of toxicity remained low in 85 patients with a median follow-up of 14.2 months. Clinicians at the European Institute of Oncology in Milan, Italy, conducted these two studies. A study of 68 patients with medically inoperable lung tumors found that image-guided stereotactic body radiation therapy (SBRT) delivered using TomoHelical provides an effective treatment option with minimal toxicity. The study was conducted at three Italian hospitals. A retrospective study evaluated the safety and efficacy of preoperative TomoHelical in combination with chemotherapy in patients with locally advanced rectal cancer (LARC). The three-year local control rate was 96.9% and treatment was well-tolerated. Clinicians at two Swiss hospitals conducted the research, which included the largest of this patient population to date. Toxicity and survival outcomes were reported for patients with high-risk prostate cancer enrolled in a phase 1-2 study evaluating hypofractionated TomoTherapy® and routine irradiation of pelvic lymph nodes. Five- and seven-year biochemical relapse-free survival (bRFS) was 87% and 80%, respectively; cancer-specific survival was 98% and 96%. Treatment was well-tolerated. Clinicians at the San Raffaele Scientific Institute in Milano, Italy conducted the study. Researchers at three European centers assessed the feasibility of boosting radiation dose to the dominant intraprostatic lesion (DIL) using the TomoTherapy System and found it to be a viable treatment option. Additionally, based on a dosimetric comparison of treatment plans, the system performed better than volumetric modulated arc radiotherapy (VMAT) in terms of achievable boost doses, target coverage and organ at risk sparing, and was similar in several aspects to intensity-modulated proton therapy (IMPT). 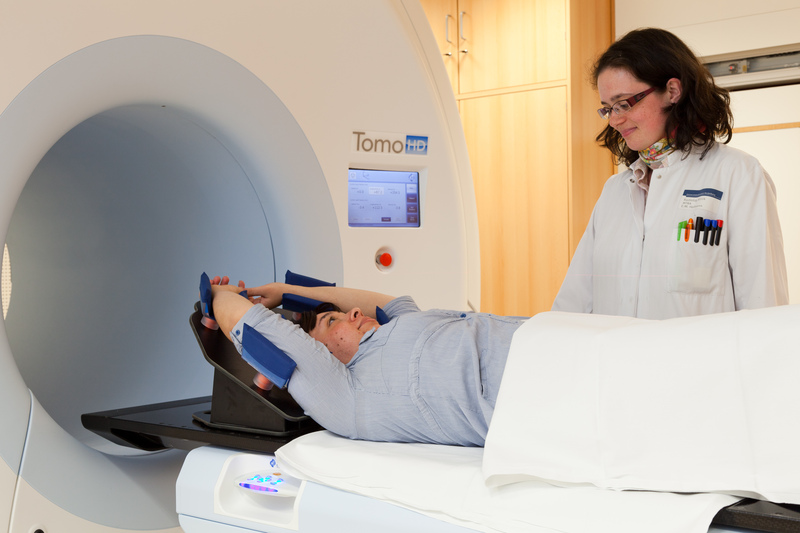 "The data presented at the ESTRO 36 meeting continue to show that the benefits of the TomoTherapy System's ring gantry platform and daily 3D image guidance in the treatment of a range of clinical indications." said Fabienne Hirigoyenberry, VP Global Medical and Scientific Affairs of Accuray. "The Radixact System, the latest generation TomoTherapy platform, provides the same unrivaled delivery capabilities while giving clinicians the versatility to treat the broad spectrum of patients and disease types with the highest level of precision and increased speed and efficiency." ESTRO 2017: New data reinforce benefits of TomoTherapy for mainstream RT treatment. Appl Rad Oncol.